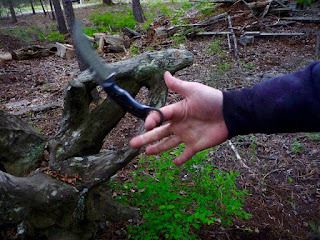 The knife has long been an essential tool for the outdoorsman and man kind in general. 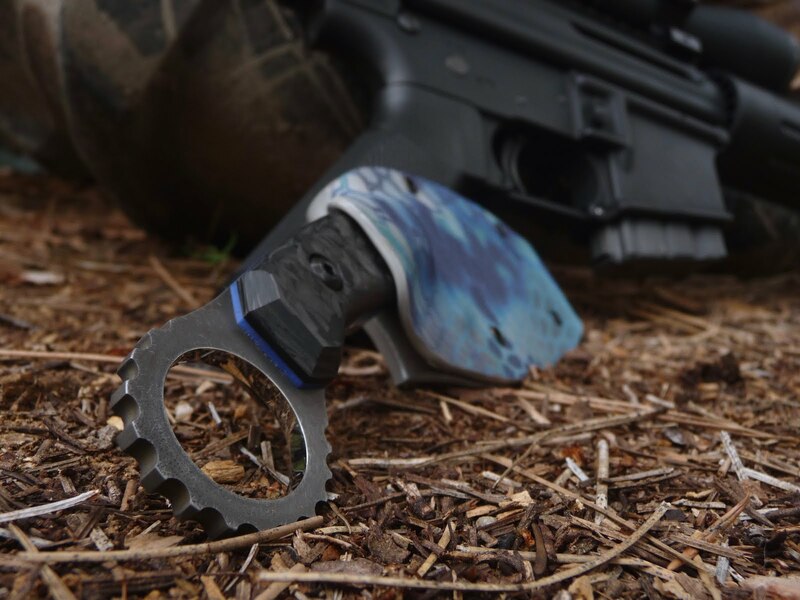 The outdoors enthusiast would never be caught without it. When you step out the door, it is the first tool in your pack or pocket, it is a sort of companion on all your great adventures. At Hook Knives we believe that companion aught to be a little part of you, a part of who you are. So let us make your dream knife to fit you. Well, here it is! I know it took me a long time to get this up, but I really wanted to use this knife for a bit to get a feel for what it really can do. Long story short, I am not disappointed. Read on to hear more about my adventure in designing this absolute work hoss of a knife. There are a lot of good Karambits being made out there, but there were also some things that I didn't see that I felt should be done. One is that most have these slender, long tips. 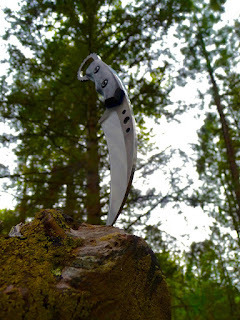 Which is effective for cutting and has a cool raptor beak scratch-your-eyes-out look, but my focus with this knife as a true survival knife is something that can go through every trial with you and thrive. 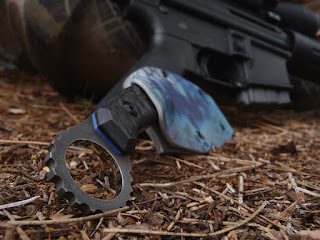 That thin little tip is just a little dainty for my tactical taste buds. Additionally, I wanted a little more meat behind that tip to provide more weight forward momentum when it is swung or spun. For you gunny folks out there I'll use this analogy: I saw a lot of .223's, but I want a 47-70. It's those fine details that take a thing from good to great. You can't help but spin it once you hold it. I also thought that marbled carbon fiber is just the coolest stuff, It's so good looking and as tough as you can ask for, heck they build race car parts out of the stuff. Plus those sleek grey hues with just a dash of sky blue from some G10 liners? I'm all about it. And finally, how about some fit and finish work? For some reason makers take tactical as a reason not to make their scales fit flush to the tang. I guess it is just a style thing, and nothing against the guys doing undersized scales, some of it is stellar work, but as for me and my house, we shall fit and finish flush. Check out my projects gallery! All Hook Knives products are proudly Gluten-free, Cage-free, and low Sodium! They are however, neither vegan nor vegetarian approved. Hook knives are built to fill the role of that essential tool that you have whenever you step off the pavement. We build them beautiful, we build them tough. We don't cut corners, we build them right. Our knives could best be considered tools. They are made for use, they are made for work. Like any tool they have a proper application. Knives are designed as a cutting tool, the edges are sharp and hard, meant for slicing and not prying or hacking. The hardness of the steel allows the blade to hold an edge for a long time, but prying with the tip of the knife can quickly chip the edge. If you want to open a soup can then a knife is not the proper tool, get a can opener. If it has a wood handle, then do not wash it in the dishwasher. 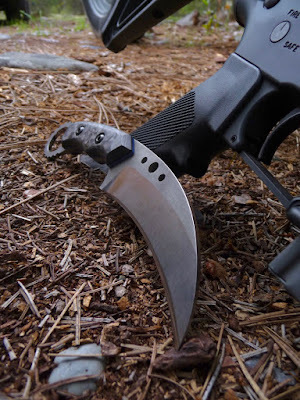 Treat your knife properly, and use it for its intended purpose, as a tool for skinning, cutting rope, or fishing line and the numerous other functions of a knife. With proper care your Hook Knife will last you for a life time of adventures in this big wonderful world! To contact us about purchasing an inventory knife or having a custom knife designed for you, E mail us at davy@hook-knives.com or call at (406) 396-6877. 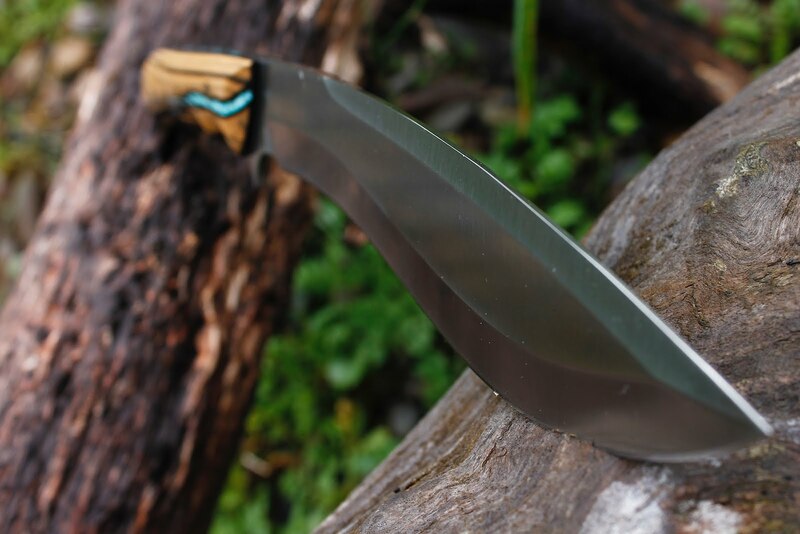 Visit hook knives's profile on Pinterest. 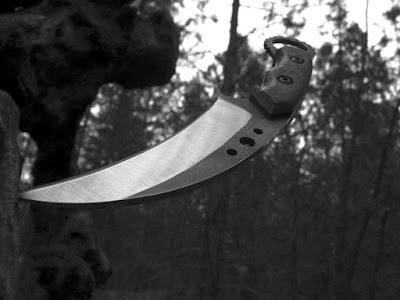 Unless otherwise stated, Hook knives are made from 9CR14 stainless (a virtual twin to 440C) or 440C stainless steel its self, the steel traditionally trusted by surgeons when lives are on the line. We hardened to 58-60 on the rockwell hardness scale. This combination is a very practical compromise between hardness and strength, meaning it weds supreme edge retention with a good resistance to chipping and cracking. Combined with the low-maintenance rust resistance of a stainless alloy this makes for a rough and rugged steel, very useful for the outdoorsman and chef alike. Stabilizing is a process by which we submerge the wood in resin and place it in our vacuum chamber to pull all the air from the wood and replace it with resin. Once activated the resin adds considerable strength, toughness and water resistance to the wood, making for an exceptionally durable handle material from even soft woods. Our stabilizing process gives nearly 100% penetration throughout the wood, meaning that even if you should happen to scratch the handle, the wood remains protected and durable. Have two woods you cant decide between? Why not both? The contrast between wood species can make for a stunning and truly unique knife. Ask us about combining your two favorite woods for just a $10.00 additional charge.